(Nanowerk News) A novel nucleating agent that builds on the concept of molecularly imprinted polymers (MIPs) could allow crystallographers access to proteins and other biological macromolecules that are usually reluctant to form crystals. The semi-liquid non-protein agent is reported by UK scientists ("Automating the application of smart materials for protein crystallization"). Sahir Khurshid, Lata Govada and Naomi Chayen of Computational and Systems Medicine at Imperial College London, working with chemists Hazim EL-Sharif and Subrayal Reddy of the University of Surrey, Guildford, explain how they have modified MIPs to give the agents a texture suitable for high-throughput trials. Their work shows improvement in crystal quality for those macromolecules that were known to be crystallizable but also boosts the probability of success when they screen for suitable crystallization conditions for more intractable proteins. The team describes the application of these materials as "simple and time-efficient" as well as offering structural biologists a new and potent tool for crystallization trials. 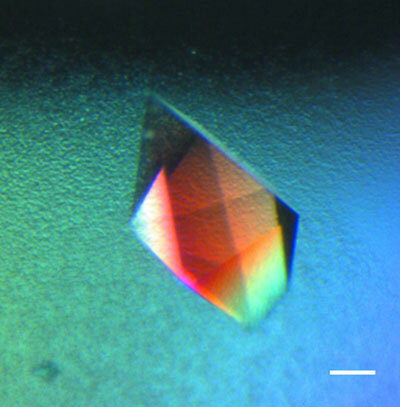 In some sense protein crystallography has stagnated for at least a decade in terms of the success rate in obtaining diffraction-quality, purified crystals. Just one in five protein targets have succumbed during this time. As such, crystallographers have been hunting for agents that could be used to seed crystal growth and make available some of the most important membrane proteins and other biological macromolecules of interest to biomedical scientists and drug developers. Various novel seeding protocols and some nucleating agents have proven useful. However, to be more widely adopted and adapted, Khurshid and colleagues suggest that novel agents must be amenable to high-throughput crystallography applications whilst preferably being non-protein. In 2011, the team reported that MIPs, which they dubbed "smart materials" could be used to nucleate crystallization of proteins. The MIPs based on polyacrylamide are synthesized in the presence of a template molecule in solution and a cross-linker reagent. Removal of the template - the protein of interest - after completion of the cross-linking step leaves behind a polymer shell with "ghost sites" containing a fingerprint of the protein. The protein can then be reintroduced under crystallization conditions and so the polymer acts as a support around which the protein might crystallize. At the time, they demonstrated proof of principle with nine proteins. Originally, the team thought that they would need a new MIP for each protein they wished to crystallize but this turned out not to be the case. A single MIP template on one protein could act as a nucleating agent for other proteins of similar molecular weight. The original MIP agents are gel-like materials, which makes them difficult to manipulate in a high-throughput system, because being viscous they cause blockages in robotic dispensing tips and other figurative bottlenecks in the equipment. An alternative approach might have been to suspend them in a solvent, but this brings its own problems. Instead, the team's current work has now developed a less viscous - close to that of low molecular weight polyethylene glycol (PEG) - generic MIP that can trap and nucleate different proteins with similar hydrodynamic radii. The team has now tested their modified MIP agent with six proteins, among them thaumatin (from Thaumatococcus daniellii), bovine pancreatic trypsin, lysozyme (from hen-egg white), and bovine hemoglobin. They then used target proteins, e.g. human macrophage migration inhibitory factor and since publication, a complex of an antibody with a fragment of the CCR5 receptor for the automated optimization trials with the templated MIPs. The agents can be stored at 4°C for several weeks and only require vortexing if unused to make them "active" again. "Having patented the design and application of MIPs for crystallization, and validated the modified MIPs for high-throughput trials, the way is now paved for commercialization," the team says.